February: Groundhog Day is a snoozefest, President's Day is underwhelming and Valentine's Day is perennially fraught (short version: "forgot it was a holiday, we're celebrating it? blah blah, oops". Yes I'm aggrieved and petty, it's why you come here, remember?). However there are some mighty nice things that happened this February and it would be a shame not to mention them! Mods: none, except that it might have taken me a few tries to get the tassel just right. The yarn is beautiful BUT you must handle with care. Why? Because if you even look at it crossly, it was break. Just come apart. So my advice is to be gentle with it and DO NOT tug it. Trust me. Luckily its fragility is redeemed by the stunning panoply of colors it come in. So score one for Jared! Sometimes I just stare at it and think "I have friends...and they made me THIS?!!". It's truly one of the most exciting things that ever happened to me. 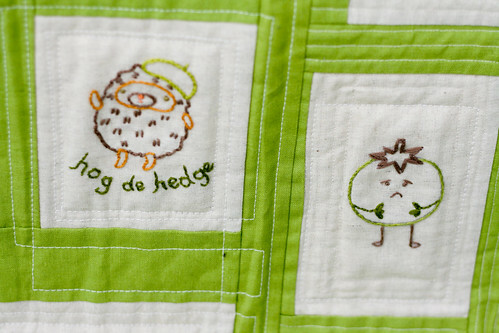 There are so many touching, darling details on this quilt that I am overwhelmed by sweetness of it. When they gave it to me (at our last meet-up, just last week!) I thought I was going to come unglued. They made this--FOR ME. Since then I take a little time every day to notice a new delightful detail. As Gary enthusiastically put it, "this is our new most prized possession". That quilt is a treasure and you are a very worthy recipient. 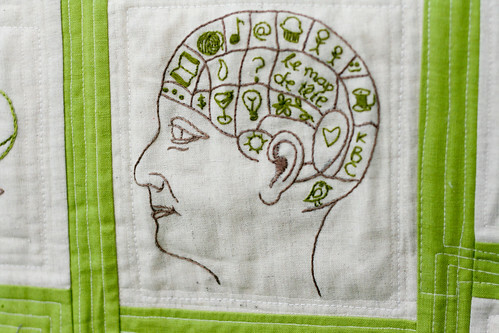 Love, love, love that phrenology head! I'm glad Gary appreciates it. I think that would be my biggest worry in giving you a gift!! 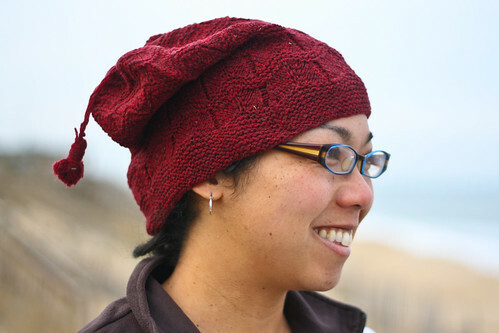 That hat looks wonderful in that yarn. It has the perfect amount of definition. And it looks cozy to boot. Maybe I'll have to get myself a skein of loft. What a beautiful, sweet gift. What an amazing quilt (and gift!). I think the phrenology head is my favorite. Thank you for solving the mystery of the hat. I saw someone wearing one in my LYS several weeks ago and have been wondering what the pattern was. Now I know! Gorgeous hat! 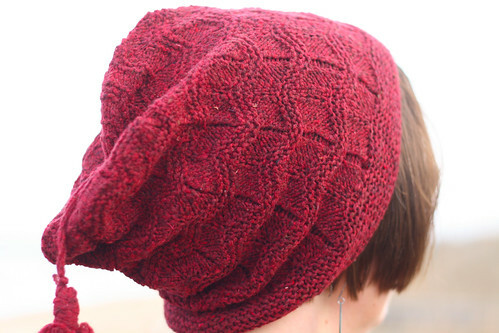 I've been pining after Brooklyn Tweed yarn, so I'm actually glad to hear there's one minor downside. That quilt is fantastic! I'm bedazzled by the phrenology head. I love the hat, and the tassel is my favorite part. Everytime I wear the hat I get compliments, and I pass the kudos along to you! OMG how funny you compare yarn to that scene from VotD! The hat is beautiful, but you've got me worried about the yarn. If it's fragile to knit with, will it make a fragile item? 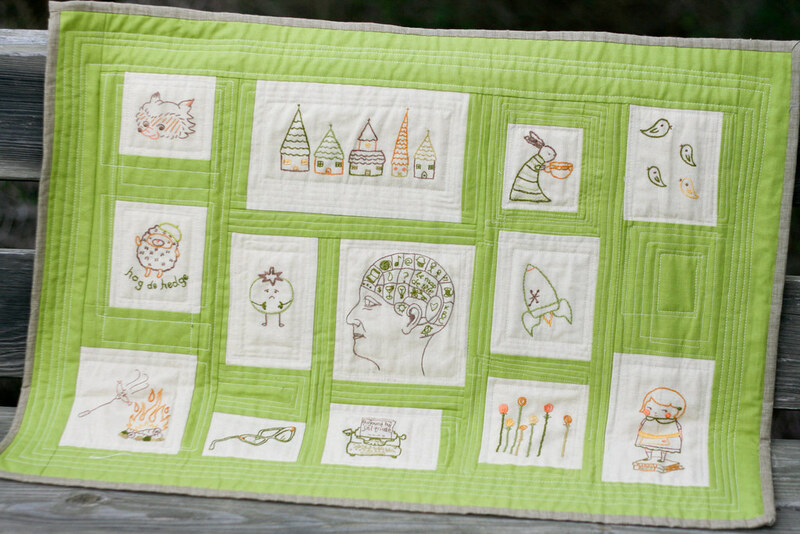 As pretty as the hat is, the quilt is really stunning. It is gorgeous -- but more importantly, it just cries out with love from your friends!